rode around the island a couple of times. 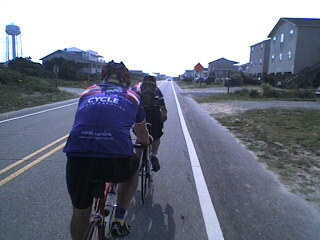 On Friday, Edbro and Red headed out with a couple of riders from Brunswick County Pedalers. Pictured are Doug and Fred, missing is Frank. Thanks guys, for the company. Maybe we’ll see you at Cycle North Carolina. We did a route the locals call the Assault on Oak Island. 32 miles with 79 feet of ascent. The only hill (aside from the bridge over the Intercoastal from Southport) is on Dolphin Road. Of course we raced to the top. His Reserve a Quiet Defense?